The Mayor of Lisburn has voiced his “heartfelt sympathies” to the family of a man who was found dead in a car in the city on Monday afternoon. The dead body of Gerry Mulligan was uncovered by police who were called to the property at around 4.20pm. A 44-year-old man has been arrested on suspicion of murder. Police announced some details of the operation later on Monday night. On Tuesday they refused to provide any further information, such as the age of the dead man or how he met his death. A source at the scene said they believed the victim had been shot. 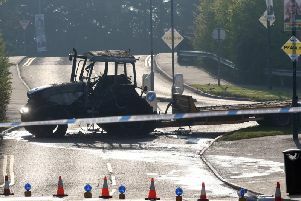 Police officers were visible on the scene in the Limehurst Way area of Lisburn on Tuesday morning. City Mayor, UUP councillor Brian Bloomfield, issued a statement around the incident, saying he was “deeply shocked and saddened by the news”. He said: “The discovery of the gentleman on Monday is devastating for his family and friends and our prayers and thoughts are with them. “It is also deeply upsetting for the local community who are understandably shocked at the events that unfolded on Monday afternoon. Edwin Poots, DUP MLA for Lagan Valley, said he believed the victim was retired, and was possibly in his 60s. He was also said to have a fondness for motorcars. Limehurst Way is known as a peaceful residential area, and neighbours say they are still in shock. One resident said the victim had lived in the flat for a number of years and was a quiet man who kept himself to himself. He said Mr Mulligan worked at cars and would, on occasion, have helped neighbours with mechanical problems. Limehurst Way is known as a peaceful residential area and neighbours say they are still in shock. He said Mr. Mulligan worked at cars and would, on occasion, have helped neighbours with mechanical problems. See original story here after it broke.